Pour the wine into a medium bowl and add the sugar, stirring until it is dissolved. Add the pineapple cubes. Cover and refrigerate for 2 hours. 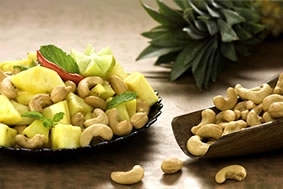 To serve, stir the delinut cashews into the pineapple. Divide among serving bowls and sprinkle with the mint.